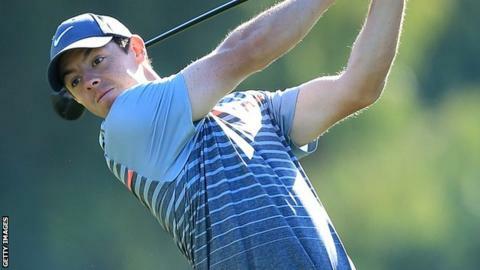 Rory McIlroy hopes to play in the WGC-HSBC Champions event in Shanghai despite suffering with food poisoning. Northern Ireland's world number three is due to tee off with Americans Dustin Johnson and Rickie Fowler at 02:45 GMT (10:45 local time) on Thursday. The 26-year-old currently leads the Race to Dubai rankings with just three tournaments remaining. "I'm not feeling great. I ate something a couple of nights ago and Tuesday wasn't good at all," he said. "I thought I would be better Wednesday morning, but I had a piece of toast and a couple of bits of melon for breakfast and I came here and tried to hit some balls, but even just making a couple of swings my stomach was too sore. "I just need another day of rest and hopefully I will be better tomorrow and I can play." Four-time major winner McIlroy is the only two-time winner of the Race to Dubai - the European Tour's season-long event - having claimed titles in 2012 and 2014. He currently leads England's Danny Willett, Irishman Shane Lowry and South African Louis Oosthuizen.